Halloween is a different festival to each person who experiences it. Its roots in Pagan holidays such as the Irish Samhain and Roman feast of Pomona have been obscured over time by its contemporary Christian and secular attributes, but in keeping with its nature as a time of remembrance for the dead, the spirit of its origins overhang it like funeral garb. Halloween is the end of Summer, when the nights are long and the earth is barren. In superstition, it is a time when the barrier between us and the otherworldly is thin, prompting people to mind themselves of the unknowable and the dead. This has long been done by eating, drinking, and dancing, but also by dressing up in fantastical costume, performing rituals, and sheltering from the looming dark. I’ve always found it a time of year when I feel particularly connected to horror; not slasher-flick, Pagan-kitsch horror, but the disquieting horror of the world around us, and of ourselves. This year, I celebrated my Halloween by seeing Godspeed You! Black Emperor. Remembrance was first and foremost on the order of service. Opener Jessica Moss, a member of Thee Silver Mt. Zion Memorial Orchestra who crafts expansive narratives using her voice, a violin, and a carpet of pedals, made as much clear as she took the stage. She spoke to the crowd personably, as if we were in a front room in her home town of Montréal, informing us that she would perform a 25-minute “journey” of “people, families, children, populations” all over the world who endure great pain in escaping the horrors inflicted on their homes. The piece started as a delicate but intricate neo-classical piece, Moss displaying impressive dexterity on the strings. As pedals were brought into play, it transformed into something weightier, with disquieting drones and overlapping melodies fleshing the piece out into a lumbering creature. Moss was a commanding and accomplished presence on stage; barefoot, swaying trancelike to the swirling music, she was visibly connected to her creation. She dealt with technical difficulties well – an out-of-order amp had her vigorously tapping the defective culprit with her bow in order to draw the attention of the crew; her ability to continue constructing atmosphere despite this problem was admirable. The one aspect of her performance which interrupted this compelling atmosphere was the first moment in which her vocals were introduced. Though they would later develop and expand just as the sparse opening violin had, her first acapella enunciations of “Entire… Populations” were jarring, and pulled me out of my immersion for a few minutes. My initial dislike of the vocal addition was eradicated as she developed it further, however – soon layers of screeching choirs and soaring laments had been added to the mix, Moss warping herself into a multitude to give voice to their suffering. Her voice is at its best when she is pushing it to its limits – her wails felt like souls being sucked into an abyss, and I felt their loss deeply. 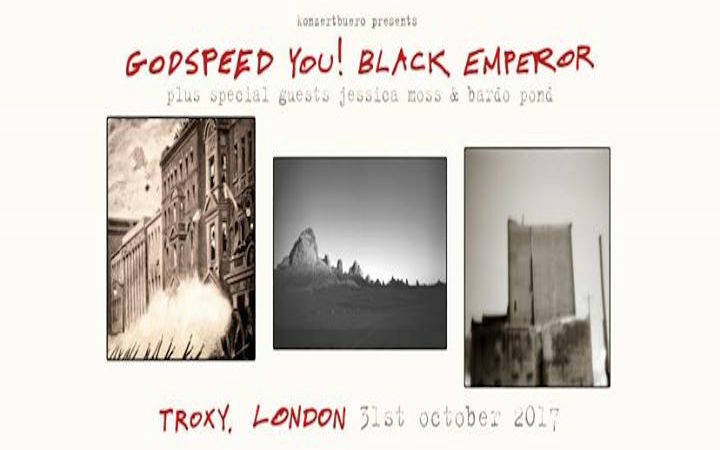 During the course of Moss’ set, the floor and balcony of The Troxy had almost filled; the anticipation for Godspeed and their second support, Bardo Pond, was palpable. Though it was a shame that fewer people had turned up to witness Moss’ powerful storytelling, as Bardo Pond commenced their slow explosion of psychedelic shoegaze it was obvious why they now arrived in droves. Their performance was arresting and hypnotic, a mass of unfurling passages rich in colour and texture. The projector at the back of the stage so essential to Godspeed’s performances got its first run during their set, and provided the perfect imagery to match Bardo Pond’s engrossing sound; lit softly by the stage lights, the band performed in front of rippling, iridescent lattice-work that wove and unwove itself like a psychedelic quilt while their music enwrapped the audience in its warmth. Their decades-long career has shaped them into a formidably tight outfit; the drums trip along mesmerising patterns enshrouded by bass and guitars in a thick, pulsating fog which the flute and vocals adorn with stunning detail. 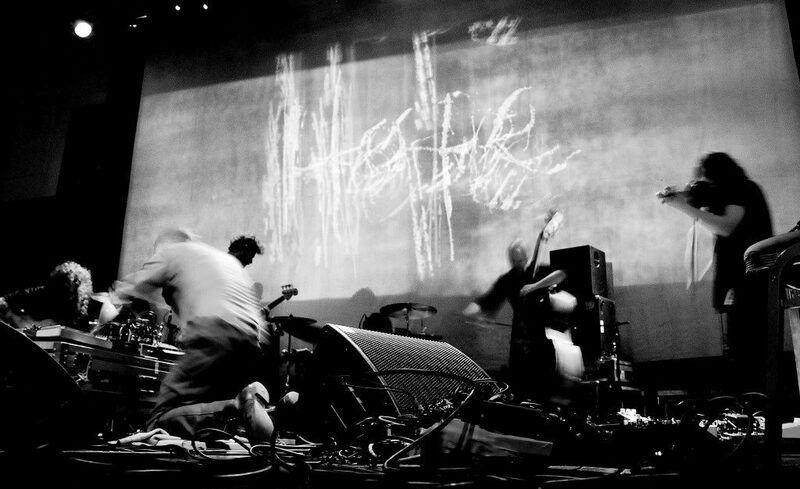 Though the band were less explicit about their themes than Moss and Godspeed, there was a clear sense of remembrance threaded through their set. The dreamlike atmosphere of their sound and vision evoked a powerful nostalgia and Sehnsucht,  describing an abstract mourning that, by the end of their overwhelmingly climactic final song, had brought me to tears. Though I had heard of the band before, I had never listened to them, but throughout their performance I was reminded by turns of Low, King Crimson, and Marriages. These touchstones would prepare someone well for Bardo Pond’s beautiful profundity, but as is always the case with singular art, they are only truly comparable to themselves. Their performance was one of the most impactful introductions to an artist I have ever received. When I roused myself from the trance Bardo Pond had put me in, I realised the size of the crowd that had now amassed for Godspeed’s set. The Troxy, a grandiose old theatre space, was filled to the rafters with faces eagerly awaiting the coming storm. It was quite a sight to see this many turn up to experience what is essentially an anti-band. Godspeed are post-rock in the purest sense: they are more orchestra than band, being comprised of at least nine people at any given point; they write expansive, winding compositions about personal, social, and spiritual apocalypse with only obscure recordings for lyrics; and they almost never do interviews or participate in other music business. By all conventional wisdom, they should not still exist – let alone be packing out a venue as large as The Troxy thousands of miles from their home and two decades from their debut album. Convention has never been Godspeed’s thing. They took to the stage piece by piece, each member laying textures upon those who came before them until a belly-aching drone flooded the room. The projector fired up, and the word ‘HOPE’, etched on a black surface like the scrawling of a desperate, nameless victim, flickered violently to the sound. This rapid-fire inscription set to an ominous cacophony is known as the ‘Hope Drone’, Godspeed’s signature opening, and it remains as affecting as ever. The rich, textured sound and flashing repetition of the word creates a semantic saturation in which hope is deconstructed, robbed of its meaning, then rebuilt inside the viewer from its roots – radical in the truest sense of the word. From this singular beginning they launched into ‘Mladic’, one of the most visceral pieces in their repertoire. When performing live, they have a freedom to indulge their less record-friendly tendencies in full, and indulge they did – they stretched out the relentless build of the first half of the song until my anticipation for its climax was almost painful, and their delivery of the awesome, ferocious folk-riffing of the song’s final stages was impeccable. The set went on to explore their newest record Luciferian Towers, embellished at either end with older material. The new songs really came into themselves live; tracks like opener ‘Undoing a Luciferian Towers’ and its companion piece from the middle of the album ‘Fam / Famine’  took on an organised chaos that was profoundly unsettling. With wild, skronking saxophone notably taking centre-stage, the sound emanating was writhing, a flailing behemoth collapsing in slow motion. Accompanying this all the while was the projector. Two reels of film were being manipulated in real time and in parallel, footage of degraded cities, rusting train tracks and snow-stifled landscapes twisting in sepia behind the band. At one point, the tapes were melted live, the images distorting in slow chemical bubbles, snapshots of society dissolving as if in an acid bath of sound. Godspeed’s marriage of sound and vision surpassed even that of Bardo Pond earlier in the night; the sensation of soaring desolation when ‘Bosses Hang’ lumbered towards its zenith as a camera slow-panned up the side of a seemingly endless high-rise is hard to relate. The extent to which the visuals are an essential element of the outfit’s creation is almost enough to make one hesitant to listen to a Godspeed record again, for fear of missing this crucial and powerful aspect of the art – but not quite enough. 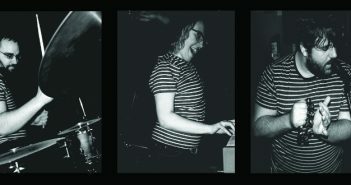 The band closed out their set with an old fan favourite – ‘Blaise Bailey Finnegan III’. The anarchist lament, with its titular character’s poignant rant about big government, big money, and small parking fines, has always held a peculiar melancholy, but on this night, set to a backdrop of protesters being blasted by the water cannons of grotesque police trucks, it was transcendentally vicious. If you need something to revitalise your political passion, there could be nothing better. No other artist captures the hope and horror of humanity the way the Godspeed do, and on this Halloween it was just what I needed in remembrance of the lost and in hope of a reckoning to come. 2. They share a particular motif that ties them together as pieces – as with Godspeed the albums are effectively a coherent symphony, it’s kind of difficult to separate tracks like these out as they’re more like variations on a theme than separate songs outright, but there’s enough difference between the two for them to be framed as such.